Hans Arnold (1925-2010) was an artist who lived and worked in Sweden. In 1996, he illustrated the Haxens tarot (Witches tarot) with 22 black and white drawings. In 2001, he added 56 cards and pencil coloured all of them to produce the “Jolanda den Tredje” tarot , published by Fischer & Co. Jolanda the third (www.jolandadentredje.nu) is the magical name of Rosie Björkman, a famous Swedish tarot expert. 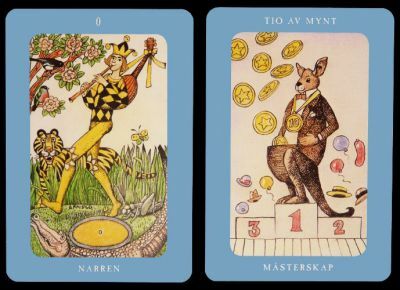 The result looks like a children book, sometime with hilarious card like the 10 of coins (tio av mynt) showing a kangaroo in a tuxedo. Price and where to find: Less than 200 Swedish crowns, 24 € for the AGM 2008 edition.